The strong sunlight and heat drenched arid landscape above the gorges was a complete contrast to the flora and lush environment within the gorges. This first general impression left me with a mental image of many light and feathery textures; the soft blue-purple distant ranges with light grey-brown dotted lines indicating foliage or closer ranges sometimes light khaki in colour with rusty rocky ridges. 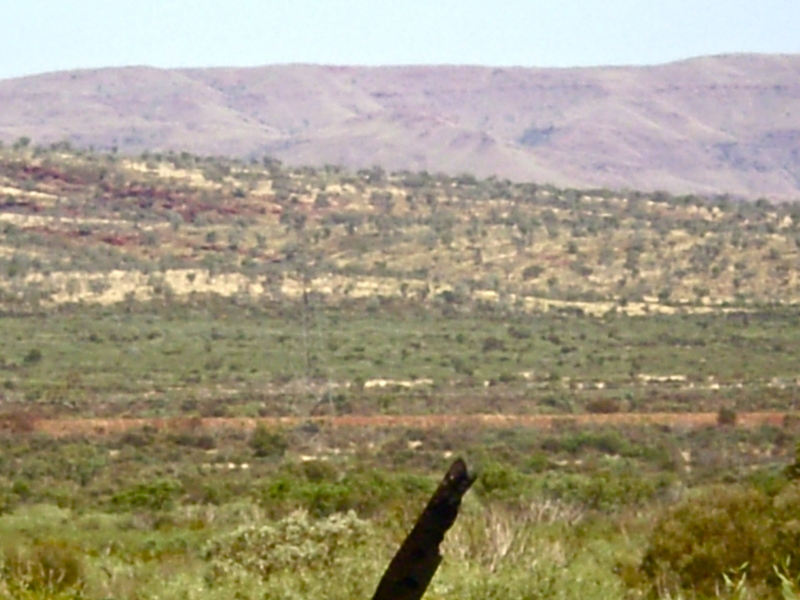 A mixture of middle distance greens ranged from dotted pale olive and sage with dull Naples yellow background followed by foreground yellow and sage spinifex growing from red-purple soil. This image contrasted with the heavy muscular rock forms with strong vibrant coloured surfaces; red iron dark and shiny veins of iron ore as well as asbestos. Rich, lush greens of the vegetation varied from ferns to fig tree roots which like the Snappy gums appeared to hold together parts of the side of the gorge. Large boulders were strewn onto the gorge floor. The image above was taken from Mt. Bruce a short distance from the gorges. In the gorges I selected particular reflections and vegetation as a point of contrast because they had a ‘Monet garden’ look about them without the horizon. 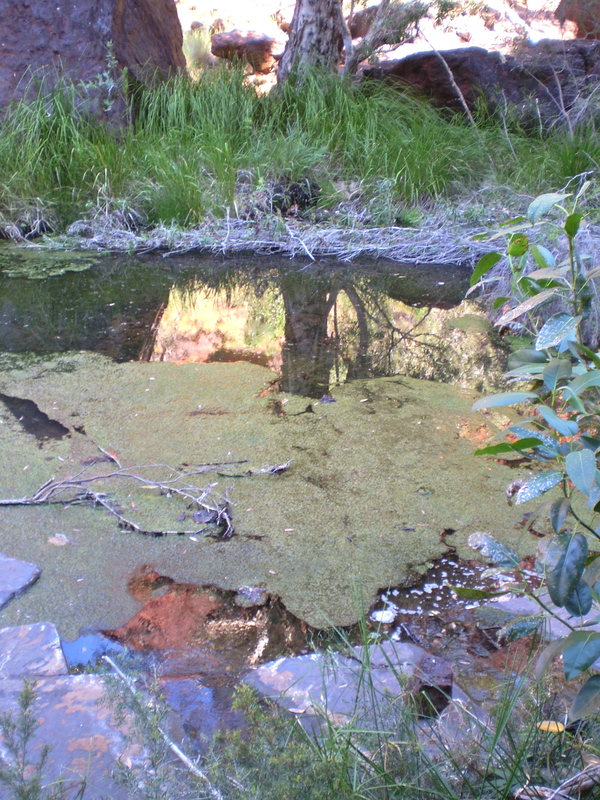 ‘ Monet’s garden 1’ in Dales Gorge. 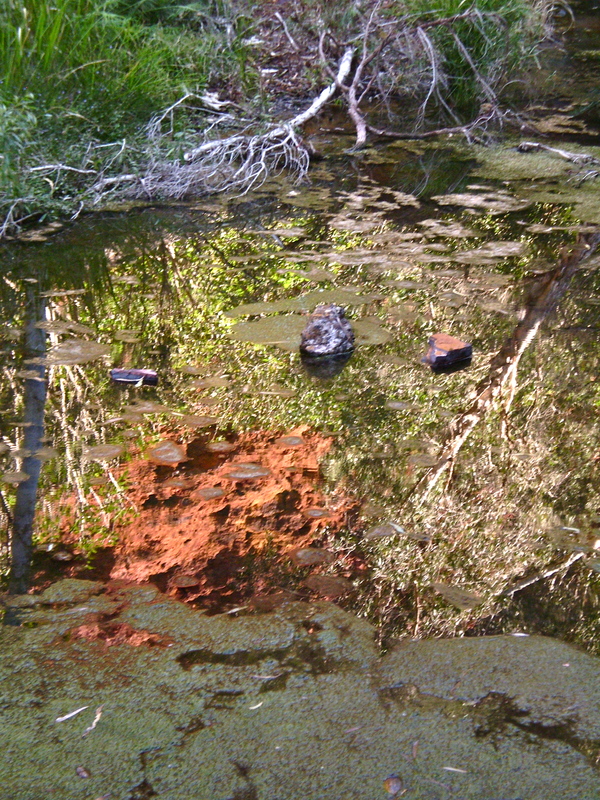 ‘ Monet’s garden 2’ in Dales gorge. Categories: Preliminary photographs | Tags: colours, contrast, Karijini National Park, texture | Permalink.